+ve visited my sister and family in Dunoon. +ve was sunny today and I spent some time in a park sketching, then doing some guerrilla filming on Byres Rd. OK, so to tally up… 11 +ve / 7 -ve …so all is well and good with the world. 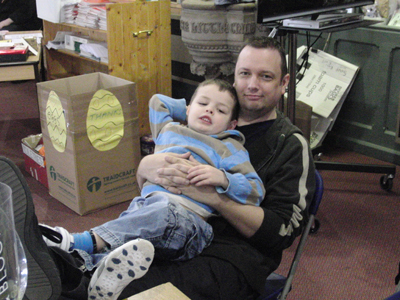 So here is a photo of Jake and I relaxing during the morning service last week (sorry about the messy background, what can you do)! This entry was posted on Saturday, March 20th, 2010 at 10:19 pm and is filed under +ve/-ve, books, church, Glasgow, music, Video and Video Editing. You can follow any responses to this entry through the RSS 2.0 feed. You can leave a response, or trackback from your own site.